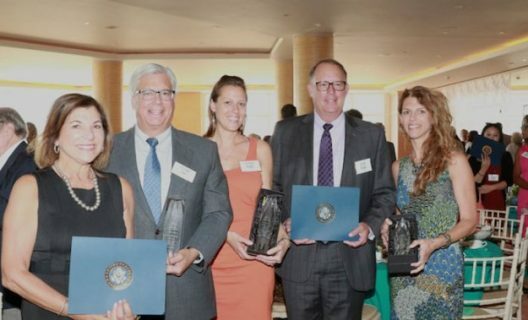 2018 Heroes of Hospice award recipients (L-R) Marybeth Carty, Montecito Bank & Trust (represented by George Leis), Organic Soup Kitchen (represented by Andrea Slaby), Cottage Children’s Medical Center Hematology/Oncology (represented by Herb Geary), and Teddy Bear Cancer Foundation (represented by Lindsey Leonard). Photo by Monie deWit. 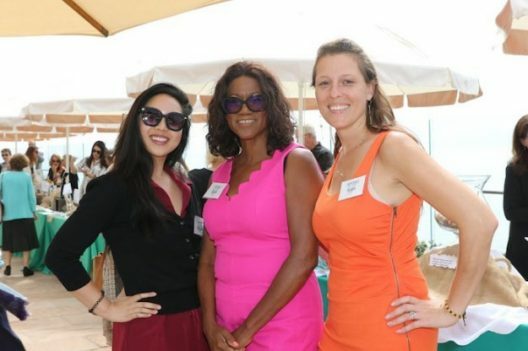 Hospice of Santa Barbara (HSB) hosted about 340 guests at the 6th Annual Heroes of Hospice “Jewels by the Sea” Luncheon last week at the Four Seasons Biltmore, Coral Casino. Each year, HSB recognizes the outstanding organizations and individuals who continue to play an important role in service to those in our community and/or support the organization’s mission of providing care to anyone experiencing the impact of serious illness or grieving the death of a loved one. 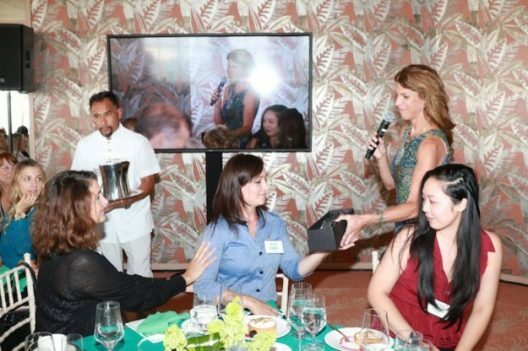 The luncheon raised approximately $150,000 to support HSB’s programs. Jenny Nguyen, Diana Joiner, and Andrea Slaby representing Organic Soup Kitchen, who received HSB’s Volunteer Award. Photo by Monie deWit. 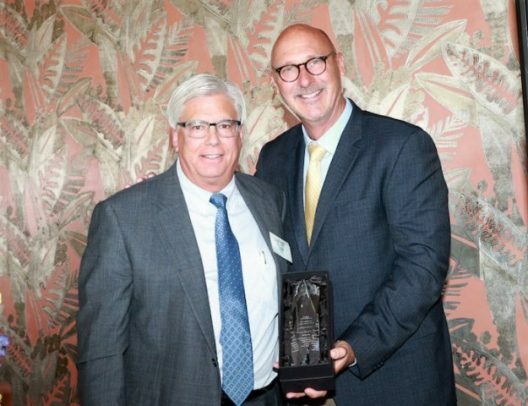 Montecito Bank & Trust President George Leis, accepting the Legacy Award on behalf of the bank. Photo by Monie deWit. 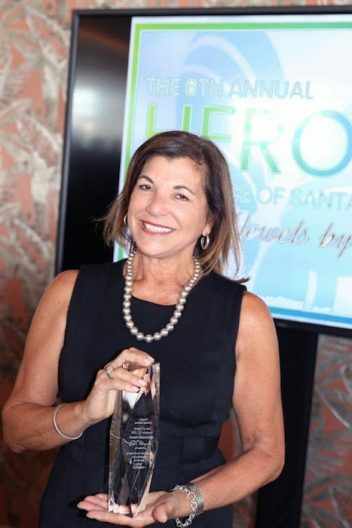 The 2018 honorees included Partnership Awards to Teddy Bear Cancer Foundation and Cottage Children’s Medical Center Hematology/Oncology, Legacy Award to Montecito Bank & Trust, Volunteer Award to Organic Soup Kitchen, and Ambassador Award to Marybeth Carty, Executive Director of the Natalie Orfalea Foundation. Marybeth Carty was presented with HSB’s Ambassador Award. Photo by Monie deWit. Jesse Brisendine, certified life coach, speaker, and author, gave a moving testimonial about children’s grief and the power of HSB’s children’s bereavement counseling program that takes place in all local secondary schools. He noted that HSB’s children’s programs have seen a more than 115% increase in the first half of 2018 over 2017. 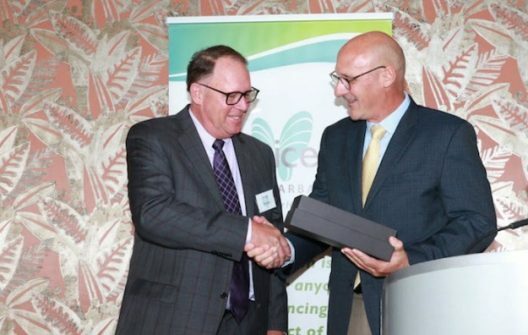 Herb Geary, Cottage Health’s Vice President of Patient Care Services and Chief Nursing Officer, accepts the Partnership Award on behalf of Cottage Children’s Medical Center Pediatric Hematology/Oncology. Photo by Monie deWit. Selberg also thanked partners in the audience for their tireless work including Dr. Charles Fenzi, Chief Executive Officer of Santa Barbara Neighborhood Clinics; Diana Rigby, Carpinteria Unified School District Superintendent; Dr. Donna S. Lewis, Goleta Union School District Superintendent; Elise Simmons, Santa Barbara High School Principal; Bill Woodward, Dos Pueblos High SchoolPrincipal; Rachael Steidl, Advisor and Founder of Youth Wellness Coalition; and Maria Chesley, Executive Director of Carpinteria Children’s Project. After accepting the Partnership Award, Teddy Bear Cancer Foundation Executive Director Lindsey Leonard presented the award to her staff. Photo by Monie deWit. Hospice of Santa Barbara provides professional counseling, support groups, and patient care services free of charge to individuals and families who are grieving the death of a loved one or experiencing the impact of a life-threatening illness. Hospice of Santa Barbara also provides counseling in their offices and on 12 local junior and high school campuses to children and teens who are grieving the loss of a loved one. 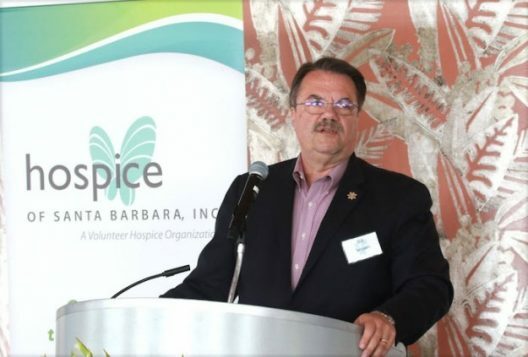 For more information about Hospice of Santa Barbara, including volunteer opportunities, call 805/563-8820 or visit www.hospiceofsantabarbara.org. 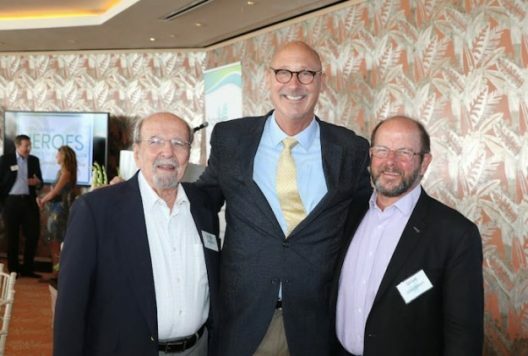 Hospice of Santa Barbara CEO David Selberg (center) with former HSB Executive Directors Charles Zimmer and Steve Jacobsen. Photo by Monie deWit. Sheriff Bill Brown addressed the audience and spoke about the importance of HSB’s programs during the Thomas Fire and Montecito Debris Flow. Photo by Monie deWit.